Osaka Japanese Language School does class formation with a small number of people based on each person’s ability for Japanese and based on their purpose. They will lead you to pass the Japanese Language Proficiency Test and university entrance examination. Osaka Japanese Language School does class formation with a small number of people based on each person’s ability for Japanese and purpose. We will lead you to pass the Japanese Language proficiency test and university entrance examination. We will lead you to pass the exam for JLPT, J-TEST, NAT, GNK, and University. Moreover, we will teach you Japanese culture and manner to work in Japan. Purpose To acquire N1(JLPT) during 2 years study hours in Osaka Japanese Language School. 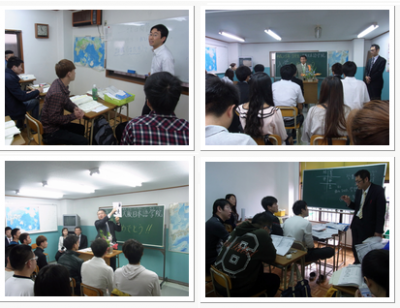 All of the students in our school enjoy studying Japanese language and Japanese culture as well. Each of them has a diffirent start and purpose after graduation, however, their world would be wider by exchanging ideas and information they have, and we are sure it will support their dreams! We are prepared many events outside to study language and culture . You cannot learn Japan only in textbook. We wish you learn how interesting Japan is. Our school corporate with a real estate management company and provides the room. The tuition and fees of Osaka Japanese Language School are as follows. Here is the estimated cost for one academic year at Osaka Japanese Language School. It is based on private dormitotry (Single room, 25,000 yen/month). The estimated cost will be changed depending on how you stay.